Home : Maplesoft Books : ENGINEERING UNCERTAINTY AND RISK ANALYSIS, Second Edition. A Balanced Approach to Probability, Statistics, Stochastic Modeling, and Stochastic Differential Equations. 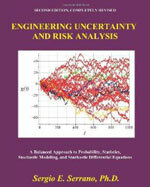 "ENGINEERING UNCERTAINTY AND RISK ANALYSIS" offers an integrated coverage of the subjects of probability, statistics, Monte Carlo simulation, descriptive and inferential statistics, design of experiments, systems reliability, fitting random data to models, analysis of variance (ANOVA), stochastic processes, and stochastic differential equations. The author for first time presents an introduction to the broad field of engineering uncertainty analysis in one comprehensive, friendly, coverage. The focus is on engineering applications, rather than theoretical or mathematical considerations. Each concept is illustrated with several examples (177 solved examples) of relevance in engineering applications (no cards, colored balls, or dice). Numerical calculations are described with simple MAPLE programs; the reader learns MAPLE gradually to become proficient by the end of the book; no prior knowledge of MAPLE is needed. This second edition includes many new research advances in nonlinear stochastic equations; new simple methods to solve and graph boundary-value problems in several dimensions without the need of perturbation, or complex traditional analytical or numerical techniques; 478 pages; 177 solved examples; 147 proposed problems; 174 illustrations, 69 short MAPLE programs; and 51 data and statistical tables.